MIDI sequencer and beat generator. Is there a better alternative to Liquid Rhythm? Is Liquid Rhythm really the best app in Music category? Will Liquid Rhythm work good on macOS 10.13.4? Liquid Rhythm is an innovative beat generator that enables users to access ten quadrillion rhythmic patterns, import pre-existing tracks created using their DAW of choice, or mine Liquid Rhythm's library of loops and kits to create uniquely natural-sounding rhythm tracks quickly and easily. Users can develop their musical ideas by instantly inserting and swapping bar-long rhythm patterns using Liquid Rhythm's BeatBuilder tools. The BeatWeaver allows users to generate genre-specific musically informed rhythm patterns from a customizable palette. 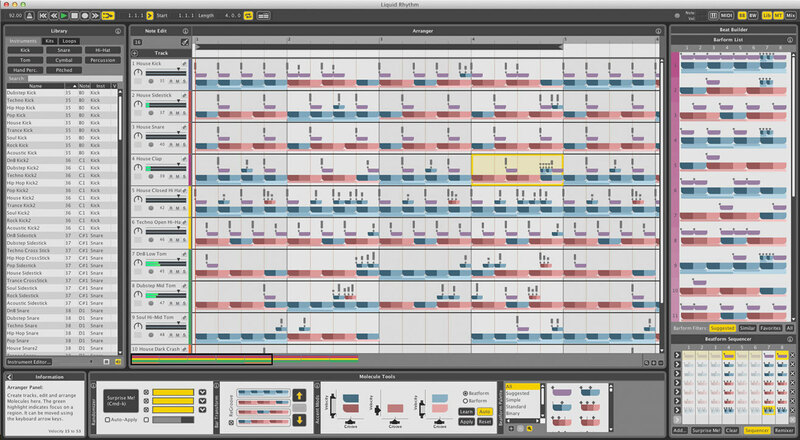 Users can create beats fast by painting groups of notes directly into the arranger, and edit the velocity and groove of multiple notes simultaneously based on underlying colour-patterns. Liquid Rhythm integrates into a variety of workflows as a VST, AU, or RTAS plugin, and functions as a clip editor in Ableton Live 9 via Max for Live. WaveDNA has also released Liquid Rhythm Intro, a condensed version of Liquid Rhythm software for greater accessibility. Visit the developer's Web site to compare the features and pricing. You can watch an introductory video on Liquid Rhythm on YouTube.